The Beatles' 1966 American release, Yesterday And Today, is arguably one of the most famous and controversial album covers ever. A copy is currently for sale on eBay, so here's your chance to grab a piece of music history. 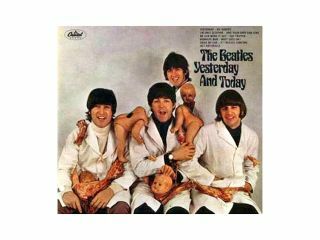 "This is an original Beatles Yesterday & Today album cover with the original 'Butcher' cover that was underneath the 'trunk' cover. The 'trunk' cover was very carefully peeled back to reveal the 'butcher' cover, so it does have some loss of resolution due to the peeling. The 'truck' cover is intact and is also included. This album does not have the LP inside, but is still a RARE Beatles valuable collectors piece. Capital Record catalog number T2553. Released in July of 1966, the Beatles 11th US LP was recalled within days and all copies were ordered to be destroyed. Photographer Robert Whitaker shot the Fab Four grinning and deranged, dressed in smocks, covered in chunks of meat, bone and dismembered baby doll parts. After the label realized they'd lose loads of money on the destroyed the covers, Capitol decided to paste a new cover on top of the old one. Thousands of people have peeled or steamed off the covers, and voila, vintage controversial dark humor is available for both collectors and baby-haters, all thanks to the internet." In the world of Beatles collecting, this is known as a 'third state' cover, as the 'trunk' cover has been removed. ('First state' covers still have their inoffensive 'trunk' covers pasted on; they're quite rare and command the highest prices. The seller of this 'third state' cover, legendsoffilm, is looking to fetch $790.00, and the current bid is $90.00 - a wee bit short. So if you have your heart set on The Beatles looking not-their-very-best, you still have a shot. The eBay sale ends September 13.